What is Builder Profile 10 (BP10)? Builder Profile 10 (BP10) helps people discover their innate talents for starting and growing something of economic value. BP10 provides a common language people can use to discuss what they do best as it relates to creating economic energy where none previously existed. BP10 is a 30-minute assessment, completed online, that measures 10 scientifically proven talents of successful builders. It allows for early identification of builder talent and provides a personalized developmental report that includes a personal ranking for each talent. Gallup developed the assessment for individuals aged 14 and older to use. Why did Gallup choose to study builders? Entrepreneurship is vital to an economy's success. People who have the talent to create customer energy where none existed create new products, services, opportunities, and - perhaps most importantly - jobs. Finding and developing these important business builders is a key component to economic growth. Gallup chose to study builders and their innate talents as a way to help establish a culture of growth. How did Gallup create BP10? Gallup's scientific approach to studying success reveals that top performers in any role exhibit similar talents - recurring patterns of thought, feeling, or behavior that naturally equip them to excel in a role. Gallup researchers applied this same research-based methodology to the study of talents in successful entrepreneurs and discovered 10 innate talents that highly successful builders possess: Confidence, Delegator, Determination, Disruptor, Independence, Knowledge, Profitability, Relationship, Risk, and Selling. Knowing the 10 talents of highly successful builders formed the basis for creating an assessment that measures those talents in an individual. Gallup researchers studied thousands of adults and high school-aged students during the multiyear development and validation of the assessment. Will BP10 determine if a person should be a builder? No. 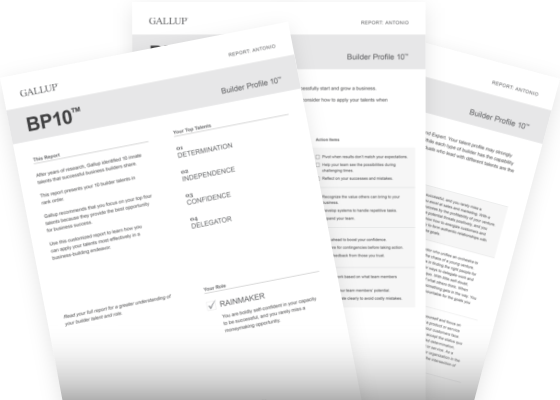 Gallup created BP10 to provide a person with self-awareness of his or her builder talents and offer a common language for conversations about how to best use and develop those talents. BP10 does not determine whether a person should or should not be a builder, nor does it offer suggestions on whether or not to start a business. Providing individuals a rank order of the 10 builder talents gives people a clear picture of their areas of talent. People can use this information to focus on the areas of talent that rank the highest for them. They can also begin to create relationships and seek learning opportunities to address areas of lesser talent. Has Gallup conducted research on the BP10 assessment? Yes, BP10 is grounded in cross-cultural research. Before finalizing the assessment, Gallup conducted international polls and collected data and qualitative feedback from entrepreneurs in Mexico, Germany, and the United States. Approximately 10% of entrepreneurs and about 40% of non-entrepreneurs in Gallup's BP10 database are from studies outside the United States. Moreover, the validity generalization estimates indicate that the correlations between builder talent and business outcomes do not vary substantially across these studies. We will continue to study cross-cultural issues with ongoing business impact research, translation process research, and ongoing polls across a variety of countries. Can I purchase multiple BP10 codes at the same time? By purchasing multiple BP10 codes, you are taking an important step toward helping others to understand and develop their entrepreneurial talent. As someone who purchased multiple BP10 codes, you will have immediate access to a code management system via the Gallup BP10 website. You can use the code management section of the website to invite individuals to complete the BP10 assessment and track their participation. Once they complete the assessment, you can view their reports. How do I use my customized report? After completing the BP10 assessment, the customized dashboard page on your Gallup Strengths Center account will display your customized report. Gallup suggests that you first read your report thoroughly. Pay specific attention to the themes at the top of your rank order and read how they describe you. How is BP10 related to CliftonStrengths? Clifton StrengthsFinder reveals your Signature Themes that guide your behavior through your life without being specific to one particular career, role, or job. BP10 is a compilation of 10 talents specific to the role of a builder. These talents enable an individual to meet the demands of the role of a builder and have strong, statistically significant linkages to specific outcomes. Gallup designed both assessments for personal development and growth by helping individuals focus on areas of strength in their life. 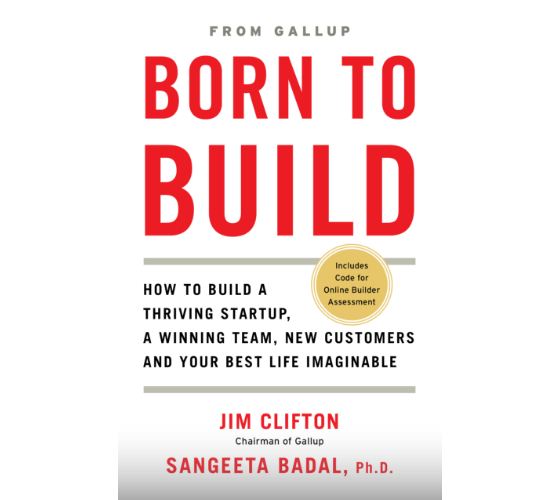 Born to Build offers readers inspiration and motivation as well as practical steps for building an enterprise of any size from scratch. Each of us is born to build, and we each have a unique set of talents. The BP10 assessment identifies your dominant builder talents and what role fits you best and gives you action items for applying your talents. To learn more about BP10, Born to Build or the Builder Initiative, fill out the form below, and a Gallup representative will contact you.